Definition at line 1412 of file app-layer-parser.c. Definition at line 1413 of file app-layer-parser.c. Definition at line 988 of file app-layer-parser.c. Definition at line 1414 of file app-layer-parser.c. Definition at line 662 of file app-layer-parser.c. References AppLayerParserCtx_::ctxs, FlowGetProtoMapping(), and AppLayerParserProtoCtx_::StateGetTxIterator. Referenced by AppLayerParserSetTransactionInspectId(), AppLayerParserTransactionsCleanup(), and OutputRegisterTxLogger(). Definition at line 1991 of file app-layer-parser.c. Definition at line 295 of file app-layer-parser.c. References ConfGetNode(), ConfValIsFalse(), ConfValIsTrue(), RunmodeIsUnittests(), SC_ERR_FATAL, SCEnter, SCLogDebug, SCLogError, SCReturnInt, and ConfNode_::val. Referenced by HTPFreeConfig(), RegisterDCERPCParsers(), RegisterDCERPCUDPParsers(), RegisterDNP3Parsers(), RegisterENIPTCPParsers(), RegisterENIPUDPParsers(), RegisterFTPParsers(), RegisterHTPParsers(), RegisterModbusParsers(), RegisterNFSTCPParsers(), RegisterNFSUDPParsers(), RegisterSMBParsers(), RegisterSMTPParsers(), RegisterSSHParsers(), RegisterSSLParsers(), RegisterTemplateParsers(), and RegisterTFTPParsers(). Definition at line 236 of file app-layer-parser.c. References SCEnter, SCReturnInt, and SMTPParserCleanup(). Definition at line 612 of file app-layer-parser.c. References AppLayerParserGetTx(), AppLayerParserCtx_::ctxs, FlowGetProtoMapping(), AppLayerGetTxIterTuple::has_next, MAX, SCEnter, SCLogDebug, SCReturn, AppLayerGetTxIterTuple::tx_id, tx_id, and AppLayerGetTxIterTuple::tx_ptr. Definition at line 818 of file app-layer-parser.c. References AppLayerParserState_::decoder_events, SCEnter, and SCReturnPtr. Referenced by AppLayerDecoderEventsSetEvent(), AppLayerParserHasDecoderEvents(), and HtpConfigRestoreBackup(). Definition at line 1039 of file app-layer-parser.c. References AppLayerParserCtx_::ctxs, FlowGetProtoMapping(), SCEnter, SCReturnInt, and AppLayerParserProtoCtx_::StateGetEventInfo. Definition at line 831 of file app-layer-parser.c. References AppLayerParserCtx_::ctxs, FlowGetProtoMapping(), SCEnter, and SCReturnPtr. Referenced by DetectAppLayerEventRegister(), HtpConfigRestoreBackup(), and HTPFileClose(). Definition at line 848 of file app-layer-parser.c. Referenced by DetectEngineStateResetTxs(), DetectFileInspectGeneric(), DetectFilenameRegister(), DetectFilestoreRegister(), FileDisableFilesize(), FileDisableMagic(), FileDisableMd5(), FileDisableSha1(), FileDisableSha256(), FileDisableStoring(), FileDisableStoringForTransaction(), OutputRegisterFiledataLogger(), and OutputRegisterFileLogger(). Definition at line 1049 of file app-layer-parser.c. References AppLayerParserCtx_::ctxs, FlowGetProtoMapping(), SCEnter, and SCReturnCT. Definition at line 597 of file app-layer-parser.c. If the stream is disrupted, we return the 'completion' value. Definition at line 996 of file app-layer-parser.c. References AppLayerParserCtx_::ctxs, FLOW_PROTO_DEFAULT, FlowGetProtoMapping(), IS_DISRUPTED, SCEnter, SCReturnInt, and unlikely. 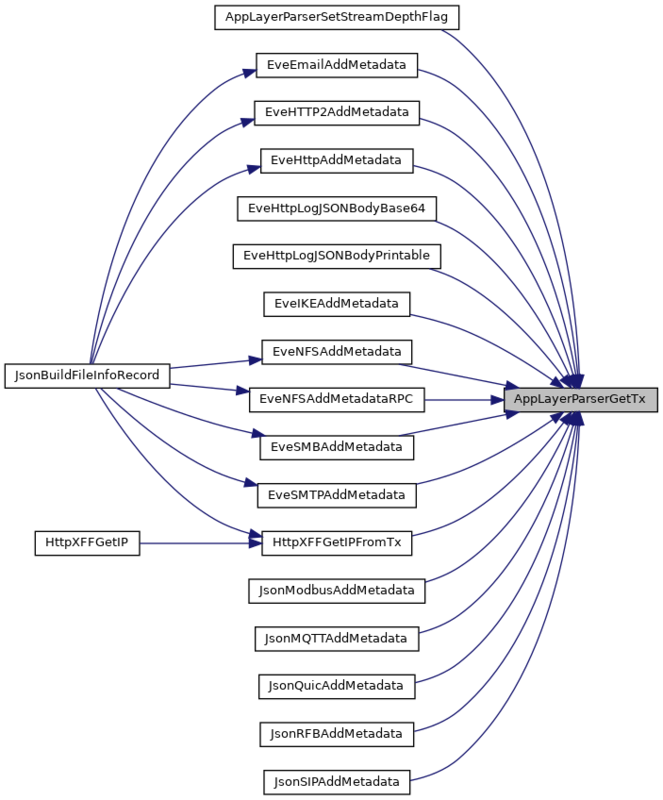 Referenced by AppLayerParserSetTransactionInspectId(), AppLayerParserTransactionsCleanup(), DetectAppLayerEventRegister(), DetectEngineInspectBufferGeneric(), DetectHttpClientBodyRegister(), DetectHttpResponseLineRegister(), and OutputRegisterTxLogger(). Definition at line 1029 of file app-layer-parser.c. References AppLayerParserCtx_::ctxs, FLOW_PROTO_DEFAULT, SCEnter, and SCReturnInt. Referenced by AppLayerParserSetTransactionInspectId(), AppLayerParserTransactionsCleanup(), DetectAppLayerEventRegister(), and OutputRegisterTxLogger(). Definition at line 1366 of file app-layer-parser.c. References Flow_::alproto, AppLayerParserCtx_::ctxs, Flow_::protomap, SCReturnInt, and AppLayerParserProtoCtx_::stream_depth. Definition at line 1058 of file app-layer-parser.c. References Flow_::alproto, AppLayerParserCtx_::ctxs, AppLayerParserState_::inspect_id, AppLayerParserState_::log_id, AppLayerParserProtoCtx_::logger, Flow_::protomap, SCEnter, SCReturnCT, and STREAM_TOSERVER. Definition at line 715 of file app-layer-parser.c. References AppLayerParserState_::inspect_id, SCEnter, SCReturnCT, and STREAM_TOSERVER. Referenced by AppLayerParserSetTransactionInspectId(), DetectEngineStateResetTxs(), DetectLuaRegister(), and HttpHeaderGetBufferSpaceForTXID(). Definition at line 698 of file app-layer-parser.c. References AppLayerParserState_::log_id, SCEnter, and SCReturnCT. Definition at line 1020 of file app-layer-parser.c. Referenced by AppLayerParserDestroyProtocolParserLocalStorage(), DetectEngineStateResetTxs(), DetectLuaRegister(), DetectPcrePayloadMatch(), DetectUricontentRegister(), HTPFileClose(), and HttpXFFGetIPFromTx(). Definition at line 1011 of file app-layer-parser.c. References Flow_::alproto, AppLayerParserCtx_::ctxs, Flow_::protomap, SCEnter, and SCReturnCT. Referenced by AppLayerParserParse(), AppLayerParserSetTransactionInspectId(), AppLayerParserTransactionsCleanup(), DetectEngineStateResetTxs(), DetectLuaRegister(), DetectPcrePayloadMatch(), FlowForceReassemblyNeedReassembly(), HttpXFFGetIP(), HttpXFFGetIPFromTx(), and OutputRegisterTxLogger(). Definition at line 1109 of file app-layer-parser.c. References AppLayerParserCtx_::ctxs, flags, FlowGetProtoMapping(), AppLayerParserProtoCtx_::GetTxDetectFlags, SCEnter, and SCReturnUInt. Referenced by AppLayerParserSetTransactionInspectId(), and AppLayerParserTransactionsCleanup(). Definition at line 1090 of file app-layer-parser.c. References AppLayerParserCtx_::ctxs, FlowGetProtoMapping(), AppLayerParserProtoCtx_::GetTxDetectState, SCEnter, and SCReturnPtr. Referenced by DetectEngineStateResetTxs(), and DetectRunStoreStateTx(). Definition at line 684 of file app-layer-parser.c. References Flow_::alproto, AppLayerParserCtx_::ctxs, Flow_::protomap, SCEnter, SCReturnUInt, and AppLayerParserProtoCtx_::StateGetTxLogged. Referenced by AppLayerParserTransactionsCleanup(), and OutputRegisterTxLogger(). Definition at line 1280 of file app-layer-parser.c. References AppLayerParserGetDecoderEvents(), AppLayerDecoderEvents_::cnt, AppLayerParserState_::decoder_events, and SCEnter. Definition at line 1298 of file app-layer-parser.c. References AppLayerParserCtx_::ctxs, FLOW_PROTO_DEFAULT, and AppLayerParserProtoCtx_::StateGetProgressCompletionStatus. Definition at line 1130 of file app-layer-parser.c. 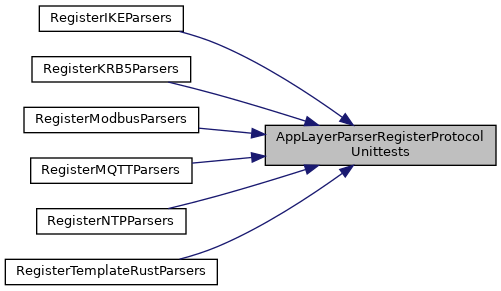 References Flow_::alparser, Flow_::alproto, AppLayerParserThreadCtx_::alproto_local_storage, Flow_::alstate, APP_LAYER_PARSER_BYPASS_READY, APP_LAYER_PARSER_EOF, APP_LAYER_PARSER_NO_INSPECTION, APP_LAYER_PARSER_NO_INSPECTION_PAYLOAD, APP_LAYER_PARSER_NO_REASSEMBLY, APP_LAYER_PARSER_OPT_ACCEPT_GAPS, AppLayerGetProtoName(), AppLayerIncTxCounter(), AppLayerParserGetTxCnt(), AppLayerParserProtocolIsTxAware(), AppLayerParserSetEOF(), AppLayerParserStateAlloc(), AppLayerParserStateSetFlag(), AppLayerParserStreamTruncated(), BUG_ON, AppLayerParserCtx_::ctxs, AppLayerParserState_::flags, Flow_::flags, FLOW_NOPAYLOAD_INSPECTION, FlowGetProtoMapping(), likely, AppLayerParserProtoCtx_::option_flags, AppLayerParserProtoCtx_::Parser, Flow_::proto, Flow_::protoctx, Flow_::protomap, SCEnter, SCLogDebug, SCReturnInt, AppLayerParserProtoCtx_::StateAlloc, STREAM_DEPTH, STREAM_EOF, STREAM_GAP, STREAM_TOCLIENT, STREAM_TOSERVER, StreamTcpDisableAppLayer(), StreamTcpSetDisableRawReassemblyFlag(), StreamTcpSetSessionBypassFlag(), and StreamTcpSetSessionNoReassemblyFlag(). Referenced by AppLayerHandleTCPData(), AppLayerHandleUdp(), AppLayerIncTxCounter(), AppLayerParserRestoreParserTable(), AppLayerParserStreamTruncated(), DetectBypassRegister(), DetectDceIfaceRegister(), DetectDceOpnumRegister(), DetectDceStubDataRegister(), DetectDNP3Register(), DetectDnsQueryRegister(), DetectEngineInspectENIP(), DetectEngineInspectModbus(), DetectEngineStateResetTxs(), DetectFtpbounceRegister(), DetectHttpRequestLineRegister(), DetectHttpResponseLineRegister(), DetectLuaRegister(), DetectPcrePayloadMatch(), DetectSshSoftwareVersionRegister(), DetectSshVersionRegister(), DetectSslStateRegister(), DetectSslVersionRegister(), DetectTemplateRustBufferRegister(), DetectTlsFingerprintRegister(), DetectTlsIssuerRegister(), DetectTlsJa3HashRegister(), DetectTlsJa3StringRegister(), DetectTlsSerialRegister(), DetectTlsSniRegister(), DetectTlsSubjectRegister(), DetectTlsValidityRegister(), DetectTlsVersionRegister(), DetectUricontentRegister(), DetectUrilenValidateContent(), FTPAtExitPrintStats(), HtpConfigRestoreBackup(), HTPFileClose(), RegisterDCERPCParsers(), RegisterDCERPCUDPParsers(), RegisterDNP3Parsers(), RegisterENIPTCPParsers(), RegisterModbusParsers(), RegisterSMBParsers(), RegisterSSHParsers(), RegisterSSLParsers(), and SMTPParserCleanup(). Definition at line 219 of file app-layer-parser.c. References ALPROTO_MAX, APP_LAYER_PARSER_INT_STREAM_DEPTH_SET, AppLayerParserCtx_::ctxs, FLOW_PROTO_DEFAULT, AppLayerParserProtoCtx_::internal_flags, TcpStreamCnf_::reassembly_depth, stream_config, and AppLayerParserProtoCtx_::stream_depth. Definition at line 1336 of file app-layer-parser.c. References AppLayerParserCtx_::ctxs, FlowGetProtoMapping(), AppLayerParserProtoCtx_::logger_bits, SCEnter, and SCReturnUInt. Definition at line 1328 of file app-layer-parser.c. References AppLayerParserCtx_::ctxs, FlowGetProtoMapping(), AppLayerParserProtoCtx_::logger, SCEnter, and SCReturnInt. Referenced by OutputRegisterTxLogger(), and RunModeInitializeOutputs(). Definition at line 1304 of file app-layer-parser.c. References AppLayerParserCtx_::ctxs, FlowGetProtoMapping(), SCEnter, SCReturnInt, and AppLayerParserProtoCtx_::StateGetTx. Referenced by AppLayerParserParse(), AppLayerRegisterThreadCounters(), AppLayerSetupCounters(), and OutputRegisterTxLogger(). Definition at line 1312 of file app-layer-parser.c. References AppLayerParserCtx_::ctxs, FlowGetProtoMapping(), SCEnter, SCReturnInt, and AppLayerParserProtoCtx_::StateGetEvents. Definition at line 1320 of file app-layer-parser.c. References AppLayerParserCtx_::ctxs, FlowGetProtoMapping(), SCEnter, SCReturnInt, and AppLayerParserProtoCtx_::StateTransactionFree. Referenced by DetectSignatureApplyActions(), FlowForceReassemblyNeedReassembly(), and SigMatchSignaturesGetSgh(). Definition at line 181 of file app-layer-parser.c. References AppLayerParserCtx_::ctxs, FlowGetProtoMapping(), and AppLayerParserProtoCtx_::StateAlloc. Definition at line 573 of file app-layer-parser.c. References AppLayerParserCtx_::ctxs, FlowGetProtoMapping(), AppLayerParserProtoCtx_::GetTxDetectFlags, SCEnter, SCReturn, and AppLayerParserProtoCtx_::SetTxDetectFlags. Referenced by RegisterHTPParsers(), RegisterNFSTCPParsers(), RegisterNFSUDPParsers(), RegisterSMBParsers(), RegisterSMTPParsers(), RegisterSSHParsers(), and RegisterSSLParsers(). Definition at line 561 of file app-layer-parser.c. References AppLayerParserCtx_::ctxs, FlowGetProtoMapping(), AppLayerParserProtoCtx_::GetTxDetectState, SCEnter, SCReturn, and AppLayerParserProtoCtx_::SetTxDetectState. Referenced by AppLayerRegisterParser(), RegisterDCERPCParsers(), RegisterDCERPCUDPParsers(), RegisterDNP3Parsers(), RegisterENIPTCPParsers(), RegisterENIPUDPParsers(), RegisterFTPParsers(), RegisterHTPParsers(), RegisterModbusParsers(), RegisterNFSTCPParsers(), RegisterNFSUDPParsers(), RegisterSMBParsers(), RegisterSMTPParsers(), RegisterSSHParsers(), RegisterSSLParsers(), RegisterTemplateParsers(), and RegisterTFTPParsers(). Definition at line 549 of file app-layer-parser.c. References AppLayerParserCtx_::ctxs, FlowGetProtoMapping(), SCEnter, and SCReturn. Referenced by AppLayerRegisterParser(), DNSAppLayerRegisterGetEventInfo(), RegisterDNP3Parsers(), RegisterENIPTCPParsers(), RegisterENIPUDPParsers(), RegisterHTPParsers(), RegisterModbusParsers(), RegisterNFSTCPParsers(), RegisterNFSUDPParsers(), RegisterSMBParsers(), RegisterSMTPParsers(), RegisterSSLParsers(), RegisterTemplateParsers(), and RegisterTFTPParsers(). Definition at line 432 of file app-layer-parser.c. References AppLayerParserCtx_::ctxs, FlowGetProtoMapping(), SCEnter, SCReturn, and AppLayerParserProtoCtx_::StateGetEvents. Referenced by AppLayerRegisterParser(), RegisterDNP3Parsers(), RegisterENIPTCPParsers(), RegisterENIPUDPParsers(), RegisterHTPParsers(), RegisterModbusParsers(), RegisterNFSTCPParsers(), RegisterNFSUDPParsers(), RegisterSMBParsers(), RegisterSMTPParsers(), RegisterSSLParsers(), RegisterTemplateParsers(), and RegisterTFTPParsers(). Definition at line 421 of file app-layer-parser.c. References AppLayerParserCtx_::ctxs, FlowGetProtoMapping(), SCEnter, SCReturn, and AppLayerParserProtoCtx_::StateGetFiles. Referenced by AppLayerRegisterParser(), RegisterFTPParsers(), RegisterHTPParsers(), RegisterNFSTCPParsers(), RegisterNFSUDPParsers(), RegisterSMBParsers(), and RegisterSMTPParsers(). Definition at line 538 of file app-layer-parser.c. References AppLayerParserCtx_::ctxs, FLOW_PROTO_DEFAULT, SCEnter, and SCReturn. Definition at line 486 of file app-layer-parser.c. Definition at line 519 of file app-layer-parser.c. Definition at line 508 of file app-layer-parser.c. Definition at line 530 of file app-layer-parser.c. References AppLayerParserCtx_::ctxs, FlowGetProtoMapping(), SCEnter, SCReturn, and AppLayerParserProtoCtx_::StateGetTxIterator. Referenced by AppLayerRegisterParser(), RegisterNFSTCPParsers(), RegisterNFSUDPParsers(), and RegisterSMBParsers(). Definition at line 407 of file app-layer-parser.c. References AppLayerParserCtx_::ctxs, FlowGetProtoMapping(), AppLayerParserProtoCtx_::LocalStorageAlloc, AppLayerParserProtoCtx_::LocalStorageFree, SCEnter, and SCReturn. Referenced by AppLayerRegisterParser(), and RegisterSMTPParsers(). Definition at line 467 of file app-layer-parser.c. References AppLayerParserCtx_::ctxs, FlowGetProtoMapping(), AppLayerParserProtoCtx_::logger, SCEnter, and SCReturn. Definition at line 458 of file app-layer-parser.c. References AppLayerParserCtx_::ctxs, FlowGetProtoMapping(), AppLayerParserProtoCtx_::logger_bits, SCEnter, and SCReturn. Definition at line 443 of file app-layer-parser.c. References AppLayerParserCtx_::ctxs, FlowGetProtoMapping(), SCEnter, SCReturn, AppLayerParserProtoCtx_::StateGetTxLogged, and AppLayerParserProtoCtx_::StateSetTxLogged. Referenced by AppLayerRegisterParser(), RegisterDNP3Parsers(), RegisterHTPParsers(), RegisterModbusParsers(), RegisterNFSTCPParsers(), RegisterNFSUDPParsers(), RegisterSMBParsers(), RegisterSMTPParsers(), RegisterSSHParsers(), RegisterSSLParsers(), RegisterTemplateParsers(), and RegisterTFTPParsers(). Definition at line 585 of file app-layer-parser.c. References AppProtoToString(), SC_WARN_DEPRECATED, SCEnter, SCLogWarning, and SCReturn. Definition at line 383 of file app-layer-parser.c. References AppLayerParserCtx_::ctxs, flags, FlowGetProtoMapping(), AppLayerParserProtoCtx_::option_flags, SCEnter, and SCReturn. Referenced by RegisterENIPTCPParsers(), RegisterNFSTCPParsers(), and RegisterSMBParsers(). Definition at line 360 of file app-layer-parser.c. References AppLayerParserCtx_::ctxs, FlowGetProtoMapping(), SCEnter, SCReturnInt, and STREAM_TOSERVER. Referenced by AppLayerParserRestoreParserTable(), AppLayerRegisterParser(), RegisterDCERPCParsers(), RegisterDCERPCUDPParsers(), RegisterDNP3Parsers(), RegisterENIPTCPParsers(), RegisterENIPUDPParsers(), RegisterFTPParsers(), RegisterHTPParsers(), RegisterModbusParsers(), RegisterNFSTCPParsers(), RegisterNFSUDPParsers(), RegisterSMBParsers(), RegisterSMTPParsers(), RegisterSSHParsers(), RegisterSSLParsers(), RegisterTemplateParsers(), and RegisterTFTPParsers(). Definition at line 372 of file app-layer-parser.c. References AppLayerParserCtx_::ctxs, AppLayerParserProtoCtx_::first_data_dir, FlowGetProtoMapping(), SCEnter, SCReturn, STREAM_TOCLIENT, and STREAM_TOSERVER. Referenced by RegisterDCERPCParsers(), RegisterDCERPCUDPParsers(), RegisterENIPTCPParsers(), RegisterENIPUDPParsers(), RegisterFTPParsers(), RegisterHTPParsers(), RegisterModbusParsers(), RegisterSSHParsers(), and RegisterSSLParsers(). Definition at line 1477 of file app-layer-parser.c. References ALPROTO_IMAP, ALPROTO_MSN, AppLayerProtoDetectConfProtoDetectionEnabled(), AppLayerProtoDetectPMRegisterPatternCS(), AppLayerProtoDetectRegisterProtocol(), RegisterDCERPCParsers(), RegisterDCERPCUDPParsers(), RegisterDHCPParsers(), RegisterDNP3Parsers(), RegisterDNSTCPParsers(), RegisterDNSUDPParsers(), RegisterENIPTCPParsers(), RegisterENIPUDPParsers(), RegisterFTPParsers(), RegisterHTPParsers(), RegisterIKEV2Parsers(), RegisterKRB5Parsers(), RegisterModbusParsers(), RegisterNFSTCPParsers(), RegisterNFSUDPParsers(), RegisterNTPParsers(), RegisterSMBParsers(), RegisterSMTPParsers(), RegisterSSHParsers(), RegisterSSLParsers(), RegisterTemplateParsers(), RegisterTemplateRustParsers(), RegisterTFTPParsers(), SCEnter, SCLogInfo, and STREAM_TOSERVER. Definition at line 1982 of file app-layer-parser.c. Referenced by RegisterDCERPCParsers(), RegisterDCERPCUDPParsers(), RegisterDHCPParsers(), RegisterDNP3Parsers(), RegisterENIPTCPParsers(), RegisterENIPUDPParsers(), RegisterFTPParsers(), RegisterHTPParsers(), RegisterModbusParsers(), RegisterNFSTCPParsers(), RegisterNFSUDPParsers(), RegisterSMBParsers(), RegisterSMTPParsers(), RegisterSSHParsers(), RegisterSSLParsers(), RegisterTemplateParsers(), RegisterTemplateRustParsers(), and RegisterTFTPParsers(). Definition at line 393 of file app-layer-parser.c. References AppLayerParserCtx_::ctxs, FlowGetProtoMapping(), SCEnter, SCReturn, AppLayerParserProtoCtx_::StateAlloc, and AppLayerParserProtoCtx_::StateFree. Definition at line 476 of file app-layer-parser.c. References AppLayerParserCtx_::ctxs, FlowGetProtoMapping(), SCEnter, SCReturn, and AppLayerParserProtoCtx_::Truncate. Referenced by RegisterHTPParsers(), RegisterSMBParsers(), and RegisterSMTPParsers(). Definition at line 497 of file app-layer-parser.c. Definition at line 2113 of file app-layer-parser.c. References ALPROTO_MAX, AppLayerParserCtx_::ctxs, FLOW_PROTO_DEFAULT, AppLayerParserProtoCtx_::RegisterUnittests, SCEnter, SCReturn, and UtRegisterTest(). Definition at line 1999 of file app-layer-parser.c. References Flow_::alproto, ALPROTO_TEST, AppLayerParserBackupParserTable(), AppLayerParserParse(), AppLayerParserRegisterParser(), AppLayerParserRegisterStateFuncs(), AppLayerParserRestoreParserTable(), AppLayerParserThreadCtxAlloc(), TcpSession_::flags, FlowGetProtoMapping(), FLOWLOCK_UNLOCK, FLOWLOCK_WRLOCK, Flow_::proto, Flow_::protoctx, Flow_::protomap, SCEnter, SCReturn, STREAM_EOF, STREAM_TOSERVER, STREAMTCP_FLAG_APP_LAYER_DISABLED, StreamTcpFreeConfig(), StreamTcpInitConfig(), TRUE, UTHBuildFlow(), and UTHFreeFlow(). Definition at line 826 of file app-layer-parser.c. Definition at line 1265 of file app-layer-parser.c. References APP_LAYER_PARSER_EOF, AppLayerParserStateSetFlag(), SCEnter, and SCReturn. Definition at line 1355 of file app-layer-parser.c. References APP_LAYER_PARSER_INT_STREAM_DEPTH_SET, AppLayerParserCtx_::ctxs, FlowGetProtoMapping(), AppLayerParserProtoCtx_::internal_flags, SCEnter, SCReturn, and AppLayerParserProtoCtx_::stream_depth. Referenced by RegisterModbusParsers(), and RegisterSMBParsers(). Definition at line 725 of file app-layer-parser.c. 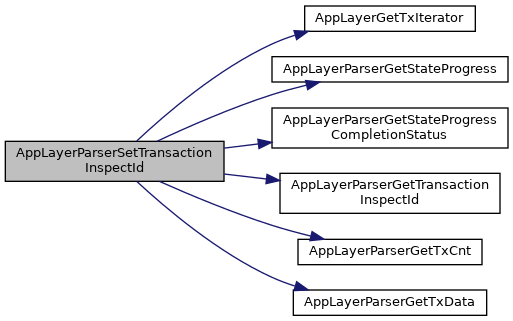 References Flow_::alproto, APP_LAYER_TX_INSPECTED_FLAG, AppLayerGetTxIterator(), AppLayerParserGetStateProgress(), AppLayerParserGetStateProgressCompletionStatus(), AppLayerParserGetTransactionInspectId(), AppLayerParserGetTxCnt(), AppLayerParserGetTxDetectFlags(), AppLayerParserSetTxDetectFlags(), AppLayerGetTxIterTuple::has_next, AppLayerParserState_::inspect_id, Flow_::proto, SCEnter, SCLogDebug, SCReturn, STREAM_TOSERVER, AppLayerGetTxIterTuple::tx_id, and AppLayerGetTxIterTuple::tx_ptr. Definition at line 705 of file app-layer-parser.c. References AppLayerParserState_::log_id, SCEnter, SCReturn, and tx_id. Definition at line 1119 of file app-layer-parser.c. References AppLayerParserCtx_::ctxs, FlowGetProtoMapping(), SCEnter, SCReturn, and AppLayerParserProtoCtx_::SetTxDetectFlags. Definition at line 1098 of file app-layer-parser.c. References Flow_::alproto, AppLayerParserCtx_::ctxs, AppLayerParserProtoCtx_::GetTxDetectState, Flow_::protomap, SCEnter, SCReturnInt, and AppLayerParserProtoCtx_::SetTxDetectState. Definition at line 670 of file app-layer-parser.c. Definition at line 212 of file app-layer-parser.c. Referenced by AppLayerSetup(), and RegisterAllModules(). Definition at line 188 of file app-layer-parser.c. References SCEnter, SCMalloc, and SCReturnPtr. Referenced by AppLayerParserParse(), and HtpConfigRestoreBackup(). Definition at line 1373 of file app-layer-parser.c. References Flow_::alproto, AppLayerParserStateFree(), AppProtoToString(), AppLayerParserCtx_::ctxs, AppLayerParserProtoCtx_::first_data_dir, FLOW_PROTO_DEFAULT, FlowGetProtoMapping(), AppLayerParserProtoCtx_::GetTxDetectState, AppLayerParserProtoCtx_::LocalStorageAlloc, AppLayerParserProtoCtx_::LocalStorageFree, AppLayerParserProtoCtx_::option_flags, AppLayerParserProtoCtx_::Parser, Flow_::protomap, SCEnter, SCReturn, AppLayerParserProtoCtx_::SetTxDetectState, AppLayerParserProtoCtx_::StateAlloc, AppLayerParserProtoCtx_::StateFree, AppLayerParserProtoCtx_::StateGetEventInfo, AppLayerParserProtoCtx_::StateGetEvents, AppLayerParserProtoCtx_::StateGetProgress, AppLayerParserProtoCtx_::StateGetProgressCompletionStatus, AppLayerParserProtoCtx_::StateGetTx, AppLayerParserProtoCtx_::StateGetTxCnt, AppLayerParserProtoCtx_::StateGetTxLogged, AppLayerParserProtoCtx_::StateSetTxLogged, and AppLayerParserProtoCtx_::StateTransactionFree. Referenced by AppLayerProtoDetectReset(), and FlowCleanupAppLayer(). Definition at line 201 of file app-layer-parser.c. References AppLayerDecoderEventsFreeEvents(), AppLayerParserState_::decoder_events, SCEnter, SCFree, and SCReturn. Definition at line 1545 of file app-layer-parser.c. References AppLayerParserState_::flags, SCEnter, and SCReturnInt. Referenced by DCERPCParser(), OutputRegisterTxLogger(), RegisterSSHParsers(), RegisterTFTPParsers(), SMTPProcessDataChunk(), and SSLVersionToString(). Definition at line 1538 of file app-layer-parser.c. References AppLayerParserState_::flags, SCEnter, and SCReturn. Referenced by AppLayerParserParse(), AppLayerParserSetEOF(), and SSLVersionToString(). Definition at line 1552 of file app-layer-parser.c. References Flow_::alproto, AppLayerParserParse(), AppLayerParserThreadCtxAlloc(), AppLayerParserThreadCtxFree(), BUG_ON, AppLayerParserCtx_::ctxs, AppLayerParserState_::decoder_events, Flow_::dp, Flow_::dst, flags, Flow_::flags, FLOW_INITIALIZE, FLOW_IPV4, FlowFree(), FlowGetProtoMapping(), AppLayerParserState_::inspect_id, AppLayerParserState_::log_id, Flow_::proto, Flow_::protoctx, Flow_::protomap, SCCalloc, SCEnter, SCLogDebug, SCReturn, Flow_::sp, Flow_::src, STREAM_EOF, STREAM_START, STREAM_TOCLIENT, STREAM_TOSERVER, and AppLayerParserProtoCtx_::Truncate. Definition at line 1076 of file app-layer-parser.c. References AppLayerParserCtx_::ctxs, FALSE, FlowGetProtoMapping(), and TRUE. Definition at line 1083 of file app-layer-parser.c. Gets a new app layer protocol's parser thread context. Non-NULL pointer on success. NULL pointer on failure. Definition at line 245 of file app-layer-parser.c. References AppLayerParserThreadCtx_::alproto_local_storage, ALPROTO_MAX, AppLayerParserGetProtocolParserLocalStorage(), FLOW_PROTO_DEFAULT, FlowGetReverseProtoMapping(), SCEnter, SCMalloc, and SCReturnPtr. Referenced by AppLayerGetCtxThread(), AppLayerParserRestoreParserTable(), AppLayerParserStreamTruncated(), DetectBypassRegister(), DetectDceIfaceRegister(), DetectDceOpnumRegister(), DetectDceStubDataRegister(), DetectDNP3Register(), DetectDnsQueryRegister(), DetectEngineInspectENIP(), DetectEngineInspectModbus(), DetectEngineStateResetTxs(), DetectFtpbounceRegister(), DetectHttpRequestLineRegister(), DetectHttpResponseLineRegister(), DetectLuaRegister(), DetectPcrePayloadMatch(), DetectSshSoftwareVersionRegister(), DetectSshVersionRegister(), DetectSslStateRegister(), DetectSslVersionRegister(), DetectTemplateRustBufferRegister(), DetectTlsFingerprintRegister(), DetectTlsIssuerRegister(), DetectTlsJa3HashRegister(), DetectTlsJa3StringRegister(), DetectTlsSerialRegister(), DetectTlsSniRegister(), DetectTlsSubjectRegister(), DetectTlsValidityRegister(), DetectTlsVersionRegister(), DetectUricontentRegister(), DetectUrilenValidateContent(), FTPAtExitPrintStats(), HtpConfigRestoreBackup(), HTPFileClose(), RegisterDCERPCParsers(), RegisterDCERPCUDPParsers(), RegisterDNP3Parsers(), RegisterENIPTCPParsers(), RegisterModbusParsers(), RegisterSMBParsers(), RegisterSSHParsers(), RegisterSSLParsers(), and SMTPParserCleanup(). tctx Pointer to the thread context to be destroyed. Definition at line 271 of file app-layer-parser.c. References AppLayerParserThreadCtx_::alproto_local_storage, ALPROTO_MAX, AppLayerParserDestroyProtocolParserLocalStorage(), FLOW_PROTO_DEFAULT, FlowGetReverseProtoMapping(), SCEnter, SCFree, and SCReturn. Referenced by AppLayerDestroyCtxThread(), AppLayerParserStreamTruncated(), DetectDceIfaceRegister(), DetectDceOpnumRegister(), DetectDceStubDataRegister(), DetectDNP3Register(), DetectDnsQueryRegister(), DetectEngineInspectENIP(), DetectEngineInspectModbus(), DetectEngineStateResetTxs(), DetectFtpbounceRegister(), DetectHttpRequestLineRegister(), DetectHttpResponseLineRegister(), DetectLuaRegister(), DetectPcrePayloadMatch(), DetectSshSoftwareVersionRegister(), DetectSshVersionRegister(), DetectSslStateRegister(), DetectSslVersionRegister(), DetectTemplateRustBufferRegister(), DetectTlsFingerprintRegister(), DetectTlsIssuerRegister(), DetectTlsJa3HashRegister(), DetectTlsJa3StringRegister(), DetectTlsSerialRegister(), DetectTlsSniRegister(), DetectTlsSubjectRegister(), DetectTlsValidityRegister(), DetectTlsVersionRegister(), DetectUricontentRegister(), DetectUrilenValidateContent(), FTPAtExitPrintStats(), HtpConfigRestoreBackup(), HTPFileClose(), RegisterDCERPCParsers(), RegisterDCERPCUDPParsers(), RegisterDNP3Parsers(), RegisterENIPTCPParsers(), RegisterModbusParsers(), RegisterSMBParsers(), RegisterSSHParsers(), RegisterSSLParsers(), and SMTPParserCleanup(). Definition at line 868 of file app-layer-parser.c. References Flow_::alparser, Flow_::alproto, Flow_::alstate, APP_LAYER_TX_INSPECTED_FLAG, AppLayerGetTxIterator(), AppLayerParserGetStateProgress(), AppLayerParserGetStateProgressCompletionStatus(), AppLayerParserGetTxCnt(), AppLayerParserGetTxDetectFlags(), AppLayerParserGetTxLogged(), AppLayerParserProtocolGetLoggerBits(), AppLayerParserCtx_::ctxs, DEBUG_ASSERT_FLOW_LOCKED, AppLayerGetTxIterTuple::has_next, AppLayerParserState_::inspect_id, AppLayerParserState_::log_id, MAX, AppLayerParserState_::min_id, next, Flow_::proto, Flow_::protomap, SCEnter, SCLogDebug, SCReturn, Flow_::sgh_toclient, Flow_::sgh_toserver, AppLayerParserProtoCtx_::StateTransactionFree, STREAM_TOCLIENT, STREAM_TOSERVER, AppLayerGetTxIterTuple::tx_id, AppLayerGetTxIterTuple::tx_ptr, and unlikely. Referenced by HtpConfigRestoreBackup(), and RegisterSMBParsers(). Definition at line 1344 of file app-layer-parser.c. References Flow_::protoctx, SCEnter, SCLogDebug, SCReturn, and StreamTcpReassembleTriggerRawReassembly(). Referenced by HTPFreeConfig(), and SSLVersionToString(). Definition at line 167 of file app-layer-parser.c. References AppLayerParserState_::inspect_id, AppLayerParserState_::log_id, and AppLayerParserState_::min_id.